Taking a break from her turns in 'Godzilla Resurgence' and 'Attack on Titan,' Satomi Ishihara heads to Nakano Broadway to check out Tokyo's No. 1 hotbed for collectibles. 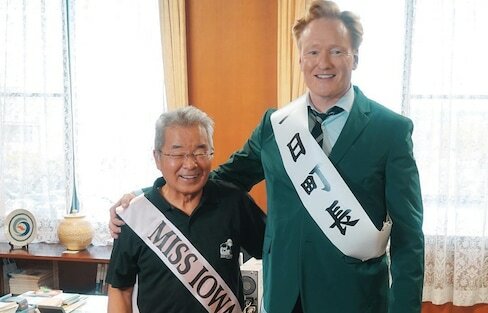 Despite one major mishap along the way, Conan O'Brien managed to make it to the town of Hokuei in Tottori Prefecture, where he met the mayor and served up some delicious hamburgers. Comedian Ken Shimura reveals a surprising skill in this video for Kirin Hyoketsu, where he's joined by Tokyo Ska Paradise Orchestra. Justin Bieber teams up with Piko Taro for a hilarious new Softbank commercial featuring pens, pineapples, apples and a whole school full of excited students. A new commercial for energy drink Chocola BB Joma features Sailor Moon looking super professional and stylish in her suit! Superstars Namie Amuro and Masaharu Fukuyama join forces to promote Asahi’s new beer, Asahi Super Dry Extra Hard. Every day after midnight, different motley crews of characters enter a tiny eatery called Shinya Shokudo, where they share their life stories. Yet the takeaway message from each episode of this manga and TV show can be remarkably profound. As the rights of the LGBT+ community are becoming a huge topic in both people's personal lives and the corporate sphere in Japan, a number of Japanese LGBT+ icons have been leading the conversation—some for a very long time!